The Ministry of the Presidency has refuted reports that Minister of Natural Resources, Raphael Trotman has been stripped of responsibility for the petroleum sector and has instead singled out his contribution to laying the groundwork for the fast-growing oil and gas sector. “The Natural Resources Minister has provided sterling leadership in the development of the sector and it is under his stewardship that significant progress has been made in capacity building and preparations for ‘first oil’,” President David Granger’s office said in a statement. Trotman on Tuesday announced that eventually responsibility for the petroleum sector would be transferred from his Ministry of Natural Resources to a Department of Energy to be housed in the Ministry of the Presidency, in keeping with a proposal he delivered to the President last year. Trotman said he would be heading a Task Force comprising of several ministers would responsible for establishing the Department. 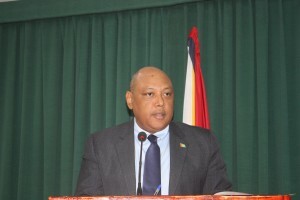 Among the “notable” achievements by the Ministry of Natural Resources under Trotman’s stewardship, government said included the signing of a Memorandum of Understanding (MoU) with the Petroleum Institute of Mexico for training and capacity building, which has seen the commencement of training for Guyanese, the drafting of the Petroleum Commission Bill, Sovereign Wealth Fund Bill and Health, Safety and Environment Regulations and the revision of the Petroleum (Exploration and Production) Act with the help of the Commonwealth Secretariat. Additionally, in keeping with Government’s intention to ensure Guyanese’ involvement in the Petroleum industry, the Ministry said an internationally recognised consultant has been retained to draft a local content policy for Government’s approval and this process is in its final stages while the capacity of the Civil Defence Commission (CDC) is being boosted to respond to any incidence of oil spill or related disasters. Government further highlighted that the Ministry of Natural Resources was also instrumental in Guyana’s acceptance as the 53rd member of the Extractive Industries Transparency Initiative (EITI) in September 2017, one of the fastest acceptance periods for any member state while the Natural Resources Fund Bill is with the Ministry of Finance and a settled draft is expected to be presented in the first quarter of 2018. “The Ministry of the Presidency condemns as false the claim that President David Granger has ‘stripped’ Minister of Natural Resources, Mr. Raphael Trotman of responsibility for oil,” Granger’s office added. The People’s Progressive Party Civic-aligned Citizens Report and Guyana Times publications on Tuesday and Wednesday reported that Trotman was “stripped” of responsibility for oil although Trotman said on Tuesday that he presented the concept note on the proposed Energy Department to President. Reflecting on what Trotman said on Tuesday, the Ministry of the Presidency slammed the two reports as “malicious and dishonest”. For his part, the Minister criticised a number of unnamed media houses for the way they have been reporting on the oil and gas sector. “A disservice is being done to the people of Guyana. It is a strange… you know I don’t know if there is a misquote or misprint so I’d rather not focus on the individual concerns but it is obvious that some media houses have an agenda. You know for a country that has less than a million people, we should be building a nation; not destroying and destroying the hopes and aspirations of a people,” Trotman added. The ministerial Task Force will include the ministers of State, Finance, Public Infrastructure, Business, Education and Social Protection, Public Security and Public Telecommunications.